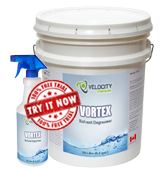 VORTEX is a powerful solvent degreaser designed to dissolve bitumen, pitch, tar and open gear grease. VORTEX is used by mining, asphalt, paving and trucking companies to remove bitumen and tar from equipment, machinery, vehicles, heat exchangers, floors and shop areas. Apply full strength using low-pressure spray. For less severe cleaning requirements dilute with up to 4 parts solvent, such as kerosene or diesel. Apply with low-pressure spray. Allow sufficient contact time (15 – 20 mins), agitating if necessary. Rinse with high-pressure water (preferably hot). Reapply if necessary. Dip tank cleaning: use at ambient temperature at full strength. VORTEX will not affect sensitive metals if use as directed. However, at full strength, VORTEX may affect some painted surfaces.